More than 200 MPs and former MPs from across the political spectrum have come together to make a clear statement: it is unacceptable for our political leaders to be investing in fossil fuels at a time of climate breakdown. Our political leaders are failing us on climate action. But together, we’re pushing our demand for a Fossil Free world to the top of the political agenda – where it firmly belongs. Over 200 MPs agree: we need a Fossil Free future. It’s time to Divest Parliament. Sign up to get stuck in to the campaign. 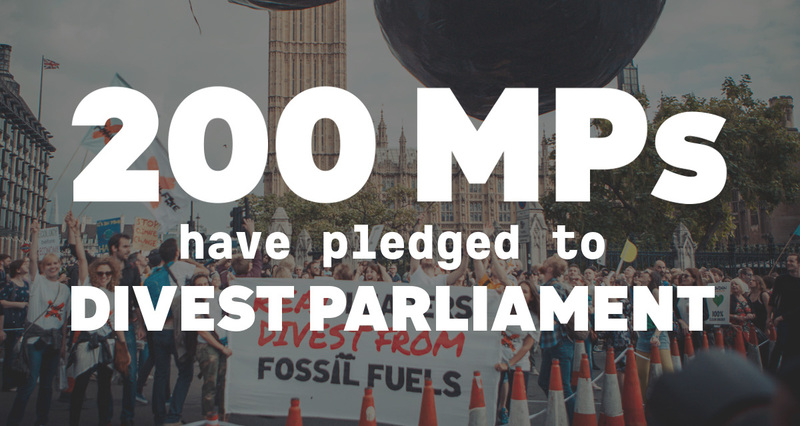 200 MPs from across the political spectrum have now pledged to Divest Parliament! We’ve got a plan to win the campaign to Divest Parliament in 2019 -- but we need everyone to get involved. Thank you for signing up to get involved the campaign to Divest Parliament! We'll be in touch soon with ways you can get stuck in where you are. Make sure to check out the website for ways you can take action, and follow the campaign on Facebook and Twitter for more. We’ve got a plan to win the campaign to Divest Parliament in 2019, but we need everyone to get involved. Sign up to get an invite to a call and get plugged into the campaign. We’ve got a plan to win the campaign to Divest Parliament in 2019, but we need everyone to get involved. We will support you to put on a political lobbying workshop to get locals skilled up and empowered to approach MPs about divestment. Fill in this survey to register interest in hosting a workshop and we will be in touch to discuss working together to make this happen. Email divestparliament@gmail.com to let us know how your MP responds and if you need any support with writing to your MP. Meeting your MP in person is the most effective way to engage them about an issue, so contact your constituency office and book a surgery meeting with your MP! Add your event to map here if you want company. Email divestparliament@gmail.com for further support ahead of meeting your MP in person. Divest Parliament works with MPs from across the political spectrum to sign our campaign pledge calling on their pension fund to phase out its substantial investments in fossil fuels. By engaging with their own pension fund, MPs have the opportunity to show crucial leadership on climate change, responsible investment and the transition to a sustainable economy. The pledge asks that the Pension Fund quantifies, reviews and discloses the fund’s investments in carbon-intensive industries, engages in a dialogue with current and former MPs and publicly commits to phasing out fossil fuel investments over an appropriate time-scale. MPs have a crucial role to play in challenging the political power of an industry that continues to push for new fossil fuels, even in the face of glaringly evident climate change impacts across the globe. The Parliamentary Contributory Pension Fund is the main pension fund for MPs serving in the House of Commons. All MPs automatically become members of the fund when they are elected to office. It currently has 637 active members (current MPs who are paying into the fund), 224 deferred members (former MPs who have not yet retired), and 1090 retired members (former MPs who are retired and are receiving their pension). It is governed by a board of 12 cross-party trustees who manage the fund on behalf of the members. In March 2017, following pressure from this campaign and the office of Caroline Lucas, the trustees made public for the first time details of the twenty largest holdings in the fund. According to the latest Annual Report, the largest investments currently made by the fund include stakes in the fossil fuel companies BP (£ 7.33 million), Royal Dutch Shell (£6.6 million), Rio Tinto (£3.67 million) and Total SA (£2.93 million). Note: This campaign is focussed solely on fossil fuels due to the gravity of climate change and the financial risks associated with fossil fuel investments. However, disclosures gained during the campaign have revealed significant investment in British American Tobacco (£7.33 million) and other controversial industries. The fund is governed by a board of 12 cross-party trustees: ten of whom are MPs or former MPs; the other two are chosen by IPSA (the Independent Parliamentary Standards Association) and the Prime Minister. The trustees look after the fund on behalf of MPs, and have a legal duty to run it in their best interests. As members of the fund, it is ultimately MPs money, and their voices should be heard. A group of MPs, spearheaded by Green Party Co-Leader Caroline Lucas, have been engaging directly with the Trustees on issues of climate risk since 2014, and remain unconvinced that these risks are being sufficiently considered. Their names will be included on the public list of supporters, and they’ll be kept up to date with further progress on the campaign, as well as opportunities to get more involved, including participating in key meetings with the trustees of the fund. By having many MPs from across the political spectrum sign our pledge, we demonstrate growing political support for divestment from fossil fuels and reinvestment into a zero-carbon future. This support allows us to effectively pressure the trustees of the MPs pension fund and means they take the issues more seriously. This is a numbers game. The more former and current MPs we get signing the pledge, the more pressure the fund is under to act. This is why need constituents all over the UK to engage with their MPs on the issue and ask their MP to sign our pledge! It’s crucial that MPs focus on an impactful, long term policy agenda to keep the vast majority of fossil fuels in the ground and build a sustainable economy. However, they can also show leadership in other areas, starting with the management of their own pension fund. The Paris Agreement saw 196 countries commit to action on climate change to limit warming to 2 degrees, ideally 1.5. Fulfilling these promise means a step change in action today, including leaving 80% of known fossil fuel reserves in the ground. From South African Apartheid to Tobacco, we know that divestment campaigns have had huge impacts at shifting the discourse on key political issues and making change in the past. And there’s no issue that needs a gear change more than climate. Through significant political lobbying, the fossil fuel industry has been a key barrier to meaningful legislation on climate change. Similarly with Tobacco, a powerful divestment campaign sought to reduce the political power of Big Tobacco and brought in science based policy on smoking. By addressing climate risk in their own pension fund and supporting the divestment movement, MPs can show commitment and leadership on tackling the crucial issue of climate change and challenge the lobbying of the fossil fuel industry. Many of those divesting from fossil fuels have used this opportunity to re-invest in the greener, cleaner technologies of the future. Renewable energy is a rapidly growing sector, with a $3 trillion annual funding gap to achieve the scale required for transition. The low-carbon transition will mean enormous job creation across a range of sectors, with the Green Finance Initiative hoping to build the UK’s position as ‘Global Hub of Green Finance’. The MPs’ pension fund is their own money, but the lack of transparency over where the money is going and how members concerns are addressed is an issue across the whole pension system. By addressing these issues in their own fund, policy makers can lead the way for more responsible investment practised across the board. For many MPs integrity is important, and being invested in companies engaging in disruptive lobbying and causing climate change will be uncomfortable. They should be able to put their money where their values are. Concerted action to decarbonise our economy, rapid technological advances in renewable energy generation and the physical constraints on extraction in a changing environment are expected to seriously devalue oil, coal and gas assets over the coming years and decades. Between $1-4 trillion worth of fossil fuel assets may become ‘stranded’, presenting a major financial risk to pension holders. This position has been endorsed by leading economists and financiers, including the Governor of the Bank of England, the World Bank and the G20’s Financial Stability Board. With decarbonisation inevitable and the renewable energy sector growing rapidly, many prudent investors are divesting from fossil fuels to protect their returns. Over 100 healthcare workers from across the UK have signed an open letter calling on doctor MPs Matthew Offord, Phillip Lee, Caroline Johnson and Andrew Murrison to sign the Divest Parliament Pledge.